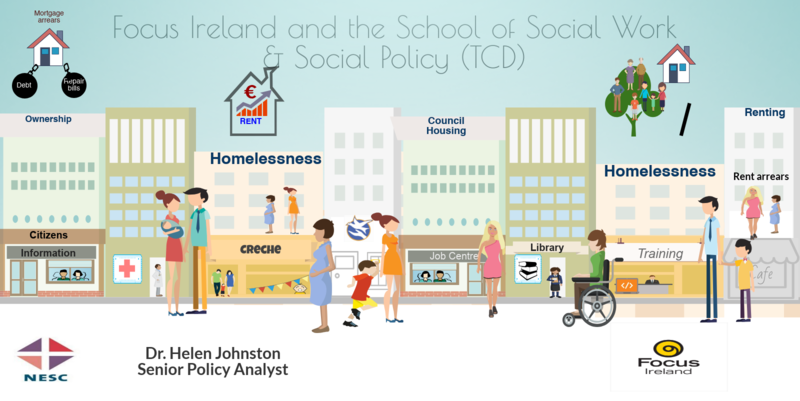 NESC’s Senior Policy Analyst Dr. Helen Johnston is chairing the Focus Ireland and the School of Social Work & Social Policy (TCD), ‘Looking beyond the Homeless Crisis’ Lecture Series with Professor Dennis Culhane (University of Pennsylvania) today Monday 23rd April 2018, 10am – 12:30pm at the Royal Society of Antiquaries, 63 Merrion Square, Dublin 2. Through the examination of large-scale quantitative evidence, this paper will demonstrate how many people who become homeless during a housing and homelessness crisis can ‘become stuck’ in homelessness for some time. Anticipatory planning is needed to ensure that appropriate and targeted interventions can address these issues effectively and in a timely manner.